United Nations officials in New York said they were "still trying to find out exactly what happened" to enable a man dressed as Colonel Harlan Sanders to get past security and into the UN building on October 22. Reports suggested that a UN security guard and apparent Sanders sympathizer had personally escorted the Colonel past security barriers and into the General Assembly. The spokesman stuck to his guns. "I wouldn't call that a meeting," he said. "No appointment [was] scheduled." He eventually conceded, though, that Sanders did experience "a brief encounter with the president of the General Assembly." That was getting a little too close to "romantic interlude" for my comfort, but the spokesman then clarified that Treki just shook hands in order to be polite. 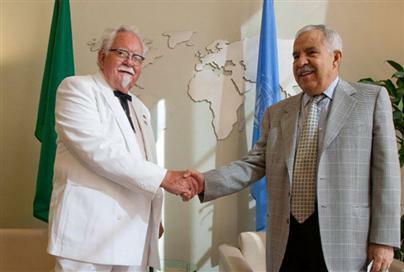 It appears that KFC dispatched the Colonel (actually a look-alike named Bob Thompson) to the UN as part of an effort to promote its new grilled chicken products. The Colonel bore an official letter from KFC's president, Roger Eaton, asking that what he called the "Grilled Nation" of KFC-lovers be registered as the 193rd UN member state. A spokesman for U.N. Secretary General Ban Ki-Moon made clear that the letter would not accomplish its goal. "That letter is absolutely void to us," she said, thus resolving the long-disputed question whether, under international law, a letter from a fast-food company could legally create an officially recognized United Nations member state made up of people who happen to eat grilled chicken products. "It has no meaning whatsoever." She suggested that the UN was considering legal action, but given the UN's overall track record I'm not sure KFC has much to worry about there. 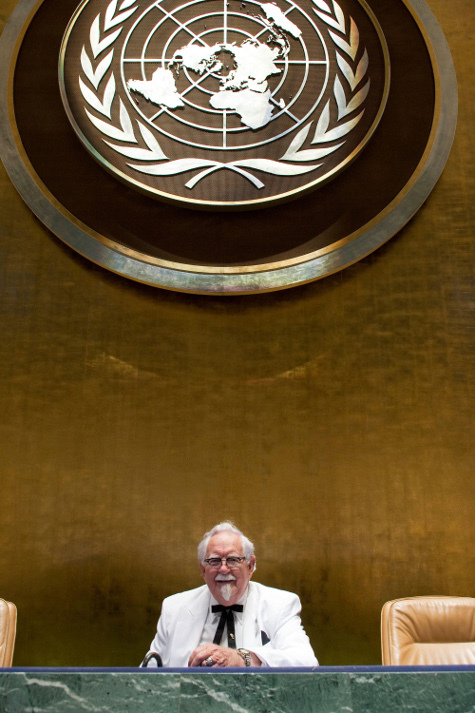 During his visit, the Colonel also posed for this picture beneath the UN logo inside the assembly chamber, the spot from which world leaders address representatives of member nations. Sadly, he did not take the opportunity to deliver any remarks himself. He can't possibly have made less sense than Muammar Qadhafi (also officially a colonel), who recently addressed the Assembly for 95 minutes in a speech so rambling and loony that the translator – his own personal interpreter – actually gave up. "I just can't take it any more," he said, and reportedly collapsed. If Colonel Qadhafi gets to address the UN, why can't Colonel Sanders? By the way, the real Harlan Sanders (who died in 1990) did have the right to the rank of Colonel, although it was an honorary rank, not a military one. According to Kentucky's Secretary of State, "Kentucky Colonel" is the "highest honor awarded by the Commonwealth," granted by the governor and secretary "in recognition of noteworthy accomplishments and outstanding service." Others granted this exalted title have included Ronald Reagan, Pope John Paul II, and Billy Ray Cyrus, at least two of whom I think have also addressed the UN. In San Francisco, members of the Grilled Nation did not seem too concerned when told about the lawsuit by a local paper. "I think anyone that eats here already understands that they are eating . . . unhealthy food," said one KFC patron. "Is it fair that you poison people with food?" he continued. "Not really, but people are eating here willingly, and people that don't know that they're eating poison here are idiots." He then went back to being willingly and yet unfairly poisoned by food that KFC had blatantly cooked for him at his request, or something like that.